I love serving food at parties that can be made way in advance so that I can be relaxed and enjoy hanging out with guests. 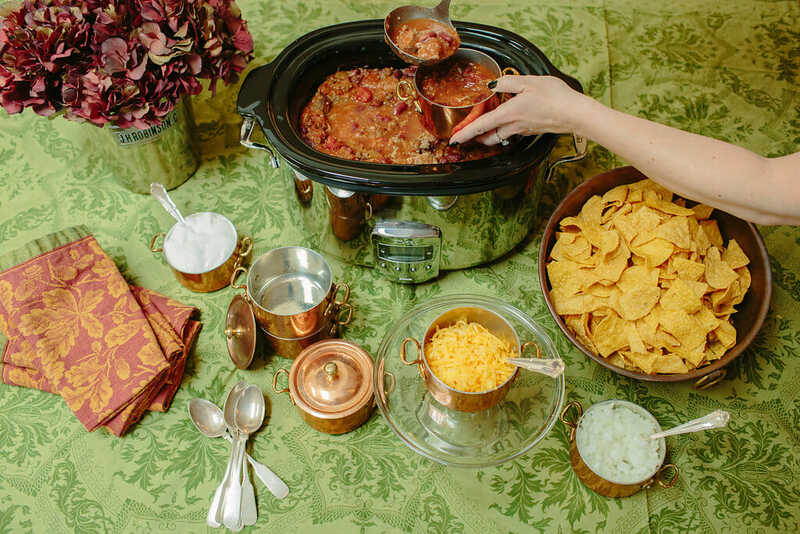 One crowd pleaser that can be made days ahead of time is a Chili Bar. One key point is that it’s important to make your set up feel special in order to elevate the chili to something special. Make chili or buy it at a fav take out place. Try NQM Beef & Bean Chili Recipe – it’s fantastic! Decide on what toppings you’d like to serve with it, prep them ahead of time and store them in your serving dish covered in saran wrap. Lay out bowls, individual mini pots (like those shown here) or mugs. Display soup spoons and napkins in a cute glass, vase or container. Warm chili in a large crock pot. I LOVE my All Clad 6.5 Quart Slow Cooker because it’s larger capacity than most, cooks really evenly and as has programmable timer settings. Serve with a side like corn bread or tortilla chips. *This contains some affiliate links but only if No Qualms Mom thinks highly of the product or service. While NQM may receive a small commission from some sellers if you buy from them, know that using my links does not affect your pricing in any way. And many NQM links are purely information – listed only to help you.